AUG Barrels available in 1/2x28 direct from Steyr. "Choose either a 16" or 20" barrel with 1/2x28 American threads and black fore grip. This 1:9 twist barrel is suppressor ready and sold exactly as shown in photo. This replacement barrel fits all models of the Steyr AUG, and will fit in any prior model from the A1 to the new AUG A3 M1. In California, it can ONLY be purchased for use with PRE BAN AUG A1, A2 AND USR. Check local states laws if unsure before purchasing." Re: AUG Barrels available in 1/2x28 direct from Steyr. If it is "suppressor ready" does it come with the suppressor gas plug then? If they are making that claim, then I would think it should. Good question, but unknown. I'm just happy that Steyr are listening and giving us more options. The ability to use 1/2x28 muzzle devices without having to get them re-threaded or without having to buy a thread converter is a plus. Now if Steyr are really listening, I'd like to be able to buy this barrel (or any 16", 18", 20", or 24"... in 13mm or 1/2") on a factory rifle, not as add-on. Also some other suggestions would be some 1:7 barrel options. A left hand bolt model from the factory would be nice too. I'm not a lefty, but I think it's a deal killer for some lefties (if they are considering an AUG), to have to go out and buy a right-hand-bolt rifle and then pay a few hundred dollars extra for a left-hand-bolt. That's not customer friendly and somewhat ridiculous. I'm still an AUG wannabe!!! The more options available to me when I finally have the funds in hand, will make my decision of what to buy a bit easier. Kudos to Steyr for the new barrel threading, but please continue to give us more options!!! Wonder if they will offer it in their factory rifles...are Steyr AUG barrels CHF? quick google search got my answer. I want to get into an AUG at some point. I really don't understand why they're unable to offer 1x7 barrels. For majority of civilian users 1:9 is just fine...up to 69gr or so...now 1:12 would be just ridiculous. Well 70 grain keyholes out of a 1x9 barrel, and the TSX and GMX rounds in 70 gr. are some of the most optimum available. Not really. Any civilian who intends to eventually put more than 2000 rounds their their AUG over its life, is going to encounter >69 gr ammo that they are going to want to shoot. Hell, 1/9 won't even stabilize Hornady's 68 gr bullet if it's cool outside at all. If folks want to split the difference, 1/8 is actually the most general twist today - i'd be fine with that. But having rifles in my house that half my ammo won't function in is silly - I'll never buy a 1/9 twist again; and caution against it today. 5 years ago, I was 1/9. but today - no. So does anyone else shoot M193 exclusively, or am I just cheap and behind the times? It's pretty neat that they're starting to offer different barrel threads, along with the Corvus partnership, they seem to be moving the right direction. I only shot 55gr to 62gr out of my platforms and M80 ball from my 308 semi autos. When punching paper anything will do. When dispatching poodles don't be screwing around, get the job done effectively and efficiently with a barrier blind round with sufficient expansion and weight retention. Only the best for the varmints. Lots of good points made already, but it just seems like a major oversight to not tweak the barrel twist to at least 1:8 if you're going to tweak the barrel thread to a more common offering. And top of all of that, please just give me a 300BO barrel...please. I could live with a 1x8. 1x9 is so 1980s. I picked up a couple of 1x7x16" barrels from Pete, however he's currently out of stock on those. I'd love to have a 1x7x20" barrel. The Federal tactical bonded 62 gr. 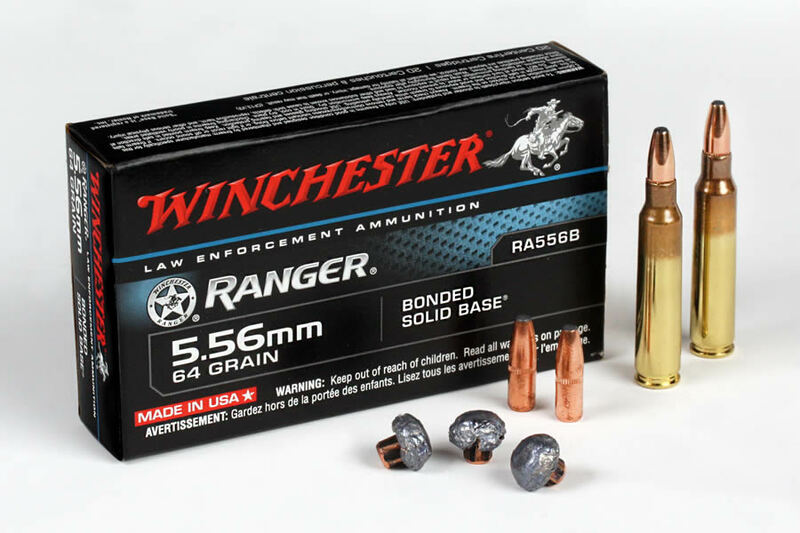 round (XM556FBIT3 aka Trophy Bonded Bear Claw) and the Winchester 64 gr. tactical bonded solid base (both FBI specs with sealed cases) have poor ballistic coefficients and are therefore not approaching MOA. However, they both get the job done extremely well (for the mouse caliber) upclose and personal with excellent expansion and weight retention. Another vote for 1x8 twist barrel based on my experience with various bullet weights on my AR's. On my 16" 1x9 AUG, I have developed a sub MOA 4 legged critter load with 60gr V-Max and CFE powder that burns clean when running suppressed.